The robotic exploration of extreme environments is an exciting topic of research and offers many possibilities for training and outreach. As the ROBEX project proceeds, periodic newsletters are produced and distributed throughout the marine and planetary research and technical communities. Public demonstrations of ROBEX and the project aims are also made by various partners and as the project develops it is hoped to increase participation with the general public. Within the ROBEX community are a number of early career scientists and technicians. Whilst many of these have a good understanding of their own working fields, the multidisciplinary nature of ROBEX means there is much for the planetary scientists and technicians to learn of the marine environment, its constraints on work etc. and vice versa. During the first year of the project several training workshops were held to introduce these various aspects of the two environments to each group of project technicians and scientists. Although there are differences in the methodologies which are employed to explore these differing extreme environments, there are also similarities. Imaging, mapping and navigation approaches may be similar within the two communities, as may be concerns on power conservation and locomotive methodologies and efficiencies. These overlapping areas have also been the focus of discussions and presentations at internal training workshops. Whatever the extreme environment under investigation, there is a requirement to derive some sort of quantification of features and observations. This could be the counting of organisms of different types in an area or the numbers of craters on an area of a planetary body (Figure 1). 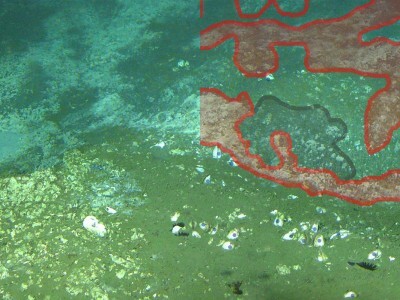 Perhaps areas of interest change over time, perhaps ice forms or melts at the poles of a planet, or on a more local scale, perhaps bacterial mats growing on a deep sea methane seep change in percentage seafloor coverage with changes in environmental conditions (Figure 2). ROBEX partners Jacobs University Bremen have developed with DLR Berlin and other partners an online course introducing a range of tools for the analysis of image data from a range of environments, often from datasets with a spatial component. The material from the course is freely available, and periodically the course is taught by ROBEX partners. Check the website for the latest details: http://imageanalysis.weebly.com/ The course introduces techniques to quantify areas of coverage (Figure 3), the area of distinct features (Figure 4) and how to statistically assess this data and use it in publications. Fig. 1 © Jacobs Universität OceanLab | Quantification of fauna and craters. Fig. 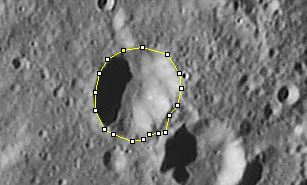 4 © Jacobs Universität OceanLab | Crater area analysis. Fig. 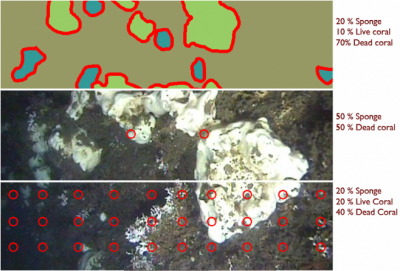 3 © Jacobs Universität OceanLab | Comparison of area quantification methods – introduced in the course.